Against this background, a number of research questions are identified per theme. Vulnerability is given a range of definitions. A number of different variables, from environmental disasters, to habitat change and industry stress, are taken into account in the measurement of vulnerability. How is the issue of vulnerability to climate change coming into being in online and scientific literature? How resonant are different national vulnerability indexes online and in scientific literature? Which are the central and which are the neglected ones? How resonant are different variables or indicators in the composition of national vulnerability indexes? What countries are of concern according to various indexes and which are the safe spots? 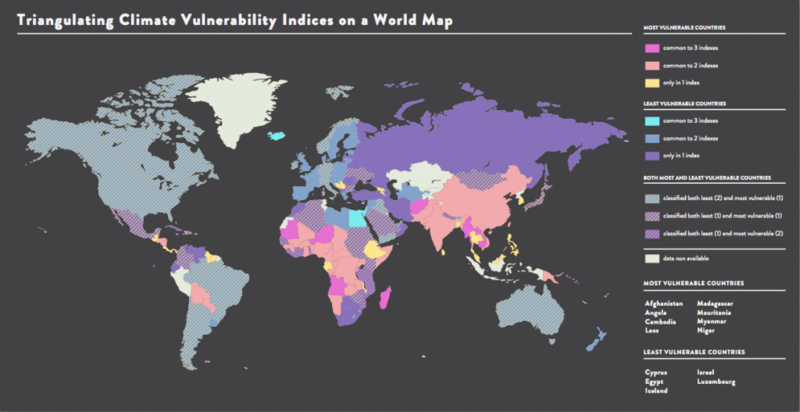 How prominent are these countries in the online issue space of climate change and that of its sub-issues (demarcated through their vulnerability indicators)? Maplecroft’s Climate Change Vulnerability Index indicates seven cities central to global economic activity as subject to extreme risk: Dhaka (Bangladesh), Manila (the Philippines), Bangkok (Thailand), Yangon (Myanmar), Jakarta (Indonesia), Ho Chi Minh City (Vietnam), and Kolkata (India). How is urban vulnerability to climate change becoming an issue online? How prominent are these cities in the online issue space of climate change and that of its sub-issues (demarcated through their vulnerability indicators)? How does this resonance vary across online issue spaces, looking at a city’s resonance within climate change on Google.com, Google News, Twitter and other spaces? How does imagery (using Google Image results) depict urban spaces for the top most vulnerable and top most resilient cities? How is the issue of climate change adaptation discussed online? How do online debates around climate change adaptation evolve over time? How is climate change adaptation localised? How is “the local” present in online adaptation debates (as a speaker or as a subject)? Examining a database of over 300 climate change adaptation projects in Germany, provided by Competence Centre on Climate Impacts and Adaptation ( KomPass), we ask: What is the topical focus of these projects? Can issue attention cycles be identified? Who are the beneficiaries of these projects? How is the issue of loss and damage discussed online? Is it a legal issue, a humanitarian issue, an economic issue, or a development issue? What are the scenarios, actors, and associated vulnerability variables? Who is driving this agenda and which are the neglected concerns and actors? How is the issue of climate change conflict treated in various spheres online? What are the places of climate change conflicts? Who are the actors in this space? Who are the victims and decision makers? 25 March 9.30-17.00 Data sprint Media Studies, Turfdraagsterpad 9, rooms 0.12 and 0.13. 26 March 9.30-17.00 Data sprint Media Studies, Turfdraagsterpad 9, rooms 0.12 and 0.13. 27 March 9.30-17.00 Data sprint Media Studies, Turfdraagsterpad 9, rooms 0.12 and 0.13. 28 March 9.30-11.00 Presentation preparation Media Studies, Turfdraagsterpad 9, rooms 0.12 and 0.13. 11.15-12.45 Presentations Media Studies, Turfdraagsterpad 9, room 0.13. This entry was posted by Amsterdam on Thursday, January 30th, 2014 at 11:29 am. It is filed under climate change, Events. You can follow any responses to this entry through the RSS 2.0 feed. You can leave a response, or trackback from your own site. © 2014 EMAPS | Powered by WordPress | Theme 'Sirup' by 1000ff | 36 queries 0.193 sec.